Vložil/a: Entony Do rubriky Historie Středozemě, Nezařazené 23. Říjen, 2018 | 667x prohlédnuto. Back in 1997 when I was 15 years old I went to the local library in my hometown (far away in the east of the Czech Republic) to borrow a book. The old-fashioned lady knowing me very well, kept some books aside for me that I would probably be interested in. One of these books was called Setkání Lévi-Strausse s Tolkienem, a fictional conversation between Claude Lévi-Strauss and J.R.R. Tolkien based in the capital city of Prague. I was so excited! “Tolkien has been in Prague!” I shouted to my brother. When I went on reading my excitement vanished, Tolkien wasn´t in Prague. Never. Despite my disappointment I still believed there must exist a connection between Tolkien and my country, and not just in the case of Radagast and Karel Čapek. What the hell? What do they both have in common? Maybe it would be better to start my essay once again, from the beginning. Eighteen years later I had for the first time in my hands the 1937´s edition of The Hobbit and… Lo! The book is advertising on the very last page Karel Čapek´s Dashenka : Or the Life of a Puppyand Fairy Tales, the excitement is back, there´s a link to Czechia. If you´re not aware who was Karel Čapek, let me introduce you to one of the best local writers ever, but what´s more important, he – as well as Tolkien – invented a word with global significance: robot. Since the 1920s and since the 1930s we do have robots and hobbits. However, this still isn´t anything that affected Tolkien’s work. The amazing year 1937 brought us Snow White with Gandalf leading their twenty dwarfs (later > dwarves). Tolkien´s Bilbo and his soulmates saw the light of the day on the 21st of September, Walt Disney´s Snow White exactly three months later. And the world definitely changed. Back to the original topic – How the Czechs formed Mythology. Albeit Karel Čapek didn´t influence JRRT at all (as far as I know), we can find in The Hobbit up to four facts referring to my land. 1. 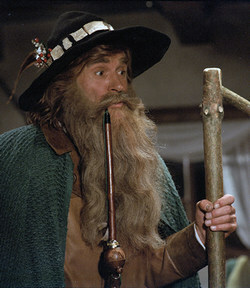 Radagast, one of the five Istari appears in Chapter VII Queer Lodgings when Gandals says: “I have heard of you, if you have not heard of me; but perhaps you have heard of my good cousin Radagast who lives near the Southern borders of Mirkwood?” The origin of the word can be found in Slavic god named Radegast (the translation of the word should be as The one who likes to be accepted as a guest), its statue can be found on Mt. Radhošť (the word Radhošť has almost the same meaning as Radegast has) in the eastern part of the Czech Republic. You can argue that the god can be just as Czech as e.g. Polish, and you would be right. No one can say which Slavic genus venerates him as first. That is exactly why I wrote “up to four facts”. Anyway, if you like beer, you can taste Radegast if you visit Moravia, the eastern part of Czechia. 2. 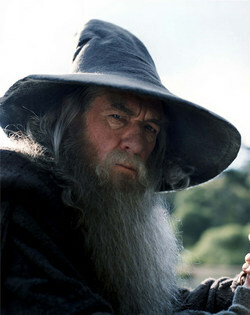 Gandalf, another and the most famous of the five Istari. Now I will repeat one of the most well-known passages of Humphrey Carpenter´s Tolkien Biography: “Before setting off on the return journey to England, Tolkien bought some picture postcards. Among them was a reproduction of a painting by a German artist, J.Madlener. It is called Der Berggeist, the mountain spirit, and it shows an old man sitting on a rock under a pine tree. He has a white beard and wears a wide-brimmed hat and a long cloak. He is talking to a white fawn that is nuzzling his upturned hands, and he has a humorous but compassionate expression; there is a glimpse of the rocky mountains in the distance. Tolkien preserved this postcard carefully, and long afterwards he wrote on the paper cover in which he kept it: ‚Origin of Gandalf’ .“ The reproduction of that postcard can be seen in The Annotated Hobbit, image called: The origin of Gandalf: a postcard, Der Berggeist, by Josef Madlener. Manfred Zimmerman develops an idea further in his article The Origin of Gandalf and Josef Madlener: „…Miss Madlener also stated that a postcard version of Der Berggeist was published in the late twenties by Ackermann Verlag München, in a folder with three or four similar pictures with motifs drawn from German mythology: a fairy lady of the woods, a deer carrying a shining cross between its antlers, ‘Rübezahl‘ (a fairy-tale character), and possibly one more.“The Czech translation of German Rübezahl is Krakonoš, spirit living in the Krkonoše Mountains located in the north Czech Republic and south of Poland. The look and feel of Krakonoš varies depending on the century and the nation. The very first graphical impression of the spirit goes back to the 16th century when Silesian cartographer Martin Helwig drew his map of Silesia including Rübenczal going from west to the east at Krkonoše Mountains looking more like a combination of lion, eagle, goat and deer than an old man as known in later centuries. 3. Beorn, I won’t spend many words about the skin-changer who killed Bolg. His first appearance in the book lies – as for Radagast – in the Chapter VII Queer Lodgings when (again) Gandalf says: “If you must know more, his name is Beorn. He is very strong, and he is a skin-changer.” As you already know the origin name for him was Medwed, similar to Czech medvěd, and similar to many other Slavic languages. If you study Middle-Earth geography precisely, and if you know all the characters and their etymologies precisely, you may find many more connections to Czechia (rivers, mountains) but I suppose figure four is good enough. Many people see Gandalf as a hero of their childhood. Yet when I grew up, Gandalf is possibly Krakonoš, the hero of bedtime stories we used to watch on our TVs (just look at YouTube seeking for “Krkonošské pohádky”), come full circle. I want to thank Ryszard Derdzinski, #tolkienancestry master from Poland,thanks him we know that John Ronald Reuel Tolkien has ancestors in Poland (though Tolkien had never been there) and I am happy to know than although Tolkien had never been to Czechia (as well), Czech coloured pencils, and maybe Czech parallels of Istari and spirits inspired the part of the biggest Mythology any mortal man created. So readers, what is my message to you? Please visit the Czech Republic, because it´s the only place in the world where during your travels you can meet Gandalf (Krakonoš), Radagast (Radegast), Beorn (Medvěd), and where you can buy your own Koh-i-Noor coloured pencils to draw the hobbit. Zdeněk Justoň. Setkání Lévi-Strausse s Tolkienem. Podlesí : Dauphin.1997. ISBN 80-86019-55-1. The internet era had not come yet so I was reliant on the books I owned. For your imagination, the first official publication of The Lord of the Rings in the Czech Republic was released in 1990s! Karel Čapek. Dášenka čili život štěněte. 1933. Karel Čapek. Devatero pohádek a ještě jedna od Josefa Čapka jako přívažek. 1932. John Ronald Reuel Tolkien. The Hobbit or There and Back Again. London : George Allen & Unwin Ltd. 1937. Humphrey Carpenter. J.R.R.Tolkien – A Biography. London : HarperCollinsPublishers. 2016. ISBN 978-0-00-820777-9. Douglas A. Anderson. The Annotated Hobbit : Revised and expanded edition. London : HarperCollinsPublishers. 2003. ISBN 0-00-713727-3. Manfred Zimmerman. The Origin of Gandalf and Josef Madlener. Mythlore 34. 1983. Pages 22 and 24. Martin Helwig, Abraham Ortelius.Mapa Slezska od Martina Helwiga. Brno : Masarykova univerzita. 2011. ISBN 978-80-210-5577-3. John D. Rateliff. The History of the Hobbit : Part One: Mr. Baggins. London : HarperCollinsPublishers. 2008. ISBN 978-0-00-726646-3. John & Priscilla Tolkien. The Tolkien Family Album.London : HarperCollinsPublishers. 1992. ISBN 0-261-10239-7. Krakonoš je Radegast prosím. A ještě toto. Přečtěte si Conan Hodina Draka. Pokusím se to vysvětlit asi takto. Gandalf i Saruman i Radegast jsou podle Tolkiena Istari, kteří se objevují i v našem prostoru. A mají plus mínus tu samou moc. Ale každý jinou. Podle svých zájmů. Saruman je zcela zjevně náš Děda Mráz alias Morozko. Nu Gandalf je takový řekněme moudrý starý pán. Rozhodně má rád zvířata. Nu a k tomu Gandalfovi. Vedle řekněme menšího vztahu k ptáčkům. Mám na mysl malé ptáčky, je zde ještě jedna vlastnost. Nikdy se nerozzuří. Známe přece příběhy z Krkonoš, kdy on vyvolává obrovské záplavy nebo bouře. Toto Gandalf nikdy neudělá. On se ovládá. A myslím, že má přírodu moc rád, než by toto udělal. Mohl by, ale neudělá to. Nu a pokud si přečtete Conana Hodinu Draka- pak zjistíte o Krkonoších víc, protože ČR leží v Nemedii. Podle Conanovských map. Samozřejmě, takto to dává smysl, byť se nelze odkazovat v případě Tolkiena na díla Howarda (ač byli současníci v určitém ohledu), a naopak. Co se týče vizuální inspirace, jedná se určitě o zmíněného Berggeista / Rübezahla, neboť právě pohlednice s jeho motivem dala vzniknout vizualizaci Gandalfa. A tam bude i Gandalf i Radegast. A aby nám tento spor rozjasnili, tak můžeme požádat vydavatele, aby se jeden oblékl do rekvizit ze studia Barrandov. A budeme mít hned jasno, kdo je komu vzorem. A také se lze podívat na obrázky. Říkám, že Radegast je podobnější Krakonošovi než Gandalfi. A dál Rozhodně je Gandalfovi podobnější akademik Richard z Návštevníků než Krakonoš z Krkonošské pohádky. To bysme pak také mohli tvrdit, že Gandalf šel a rozhodl si zahrát v tom seriálu, protože ho považoval za tak dobrý, že tam šel prostě hrát. Tím mám na mysli, že pokud sepíšeme článek, kde máme fotku jen jednoho Ishtari a ne obrázky pěti Ishtari, tak můžeme dojít k podobně bláznivému výsledku.